Morocco and Burkina Faso signed Monday three agreements on judicial cooperation in civil, commercial and administrative matters, as well as on mutual legal assistance in criminal matters and extradition. The accords were signed in Ouagadougou by visiting Moroccan Minister of Justice Mohamed Aujjar and his Burkinabe peer, Bessole Rene Bagoro. Under the extradition deal, the two countries will exchange persons who have committed reprehensible acts in each of the two countries. Aujjar also held Monday in Ouagadougou talks with Prime Minister Paul Kaba Thieba on means to promote bilateral relations. 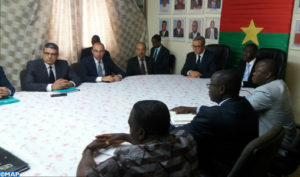 During his three-day working visit to Burkina Faso, Aujjar will also meet the first vice-president of the National Assembly and the minister of State to the Presidency. The visit will be marked by the signing of a cooperation agreement between the “Institut supérieur de la magistrature du Maroc” (higher institute of the judiciary) and its Burkinabe counterpart. Posted by Hafid El Fassy on September 4, 2018. Filed under News, Zoom. You can follow any responses to this entry through the RSS 2.0. Both comments and pings are currently closed.